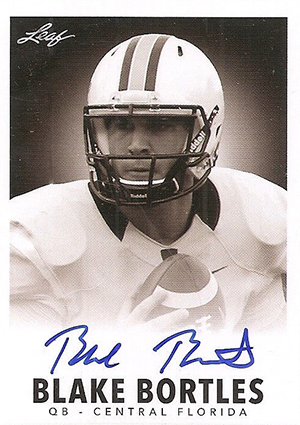 2014 Leaf Originals Football looks to both the past and the future. 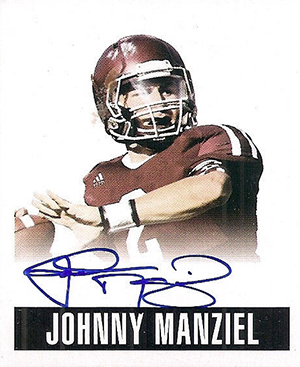 Focusing on the 2014 NFL Draft class, the all-autograph release includes five autographs per box. All are signed on-card. The 2014 Leaf Originals Football design is inspired by two sets: 1948 Leaf Baseball and 1960 Leaf Baseball. Both designs come with multiple colored parallels numbered as low as 1/1. 1948 Originals Alternate Art Autographs are variations that use a second image. These are tougher to find than the base versions. They also come with colored parallels. Masterworks Autographed Art Cards feature original art done on the card. They're also signed by the featured player. The Hot Rookie Redemption program returns. 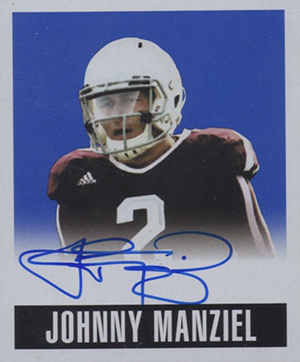 After debuting last year with Johnny Manziel cut signature art cards, these are good for a mystery player who has yet to be revealed.